I just bought a new home and this is the deck built by the builder. As you can see, the concrete landing and the stairs are misaligned. 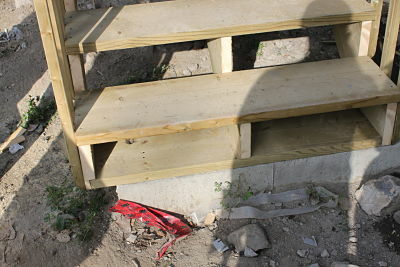 The stairs overhang and are offset from the bottom edge of the concrete slab. You can see the overhang better in the second photo. 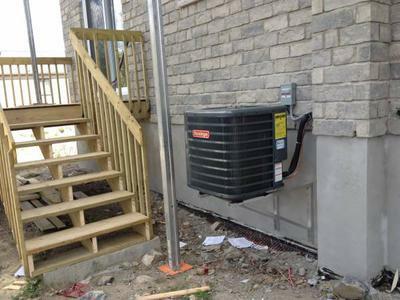 This looks like an error by the builder and while it does not look like the deck or the stairs are going to fall down any time soon as a result, it does show a lack of attention to detail. Clearly, the concrete landing slab was located where it was intended the stairs would terminate. Either the person pouring the slab for the landing or the builder of the deck erred. But this is not going to be a danger given that 90% of the stairs are secured to the slab in what appears to be a pretty solid manner. However, this is not how a new home should be built. It does not take a lot of effort to observe the location of a landing and take the appropriate measurements and build the stairs at the correct location so they align with the landing. I would demand as a condition of the final sale that the builder take the extra hour or two of time and move the stairs over 6", adjust or rebuild the portion of the affected railing and do the job the way it was supposed to be done the first time. Any builder who cares about their name and reputation would do so.